Quantitative reconstructions of long-term climate change spanning the Late Glacial and Holocene are scarce on the Qinghai-Tibetan Plateau (QTP). The environment of the QTP is highly sensitive to rapid global climatic variability owing to its large size, high altitude, and complex topography, as well as its unique bioclimatic position in relation to influences from India summer monsoon (ISM), Eastern Asian summer monsoon (EASM), and westerly circulation. The QTP has therefore been widely invoked as an ideal research focus for paleoclimatologists and paleoecologists, with a variety of proxy records that have been derived from its multiple geological archives such as ice cores, lake sediments, tree rings, and peat sections. However, the results of substantial earlier studies show significant spatial and temporal discrepancies, thus indicating a complex pattern of past climatic as well as ecological changes across the entire QTP both from east to west and from south to north. It is therefore likely that more paleoclimatic or paleoecological data based on diverse proxy records as well as climate model simulations at a wide range of temporal and spatial scales are still needed for resolving the discrepancies with respect to the nature of paleoenvironmental change on the QTP. In particular, quantitative estimates of past climate and vegetation are important for exploring in detail the characteristics of past environmental dynamics on the QTP and are thus in an increasing demand so as to possibly cope with the aforementioned issues. Dr. LI Jianyong, Profs DODSON John, and YAN Hong from the Institute of Earth Environment, Chinese Academy of Sciences, and other colleagues, provide new and numerical reconstructions for annual mean precipitation (PANN) and vegetation history over the last 18,000 years using high-resolution pollen data from Lakes Dalianhai and Qinghai on the northeastern QTP (Fig. 1). The study area was dominated by steppe and characterized with a highly variable, relatively dry climate at ~18,000–11,000 cal years B.P. PANN increased since the early Holocene, obtained a maximum at ~8000–3000 cal years B.P. with coniferous-temperate mixed forest as the dominant biome, and thereafter declined to present. 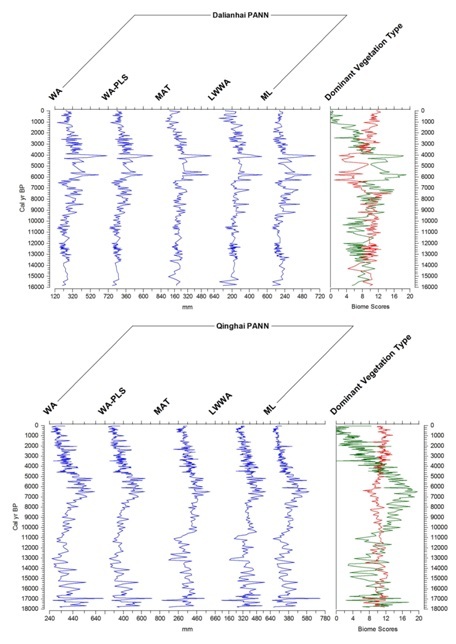 The PANN reconstructions are broadly consistent with other proxy-based paleoclimatic records from the northeastern QTP and the northern region of monsoonal China. The possible mechanisms behind the precipitation changes may be tentatively attributed to the internal feedback processes of higher latitude (e.g., North Atlantic) and lower latitude (e.g., subtropical monsoon) competing climatic regimes, which are primarily modulated by solar energy output as the external driving force (Fig. 2). This research has been lately published on the “Journal of Geophysical Research: Atmospheres” (Li, J.Y., Dodson, J., Hong, Y. et al., 2017, Quantitative precipitation estimates for the northeastern Qinghai-Tibetan Plateau over the last 18,000 years, Journal of Geophysical Research: Atmospheres, DOI: 10.1002/2016JD026333).